SAP is a key Enterprise BI data source, and Power BI connectivity to SAP has long been a sought-after feature from enterprise customers who want to unlock insights from the investments they have already made. With this release, business users can easily connect to SAP HANA using the native connector and create beautiful interactive reports and advanced analytics in a true self-service manner, without being constrained to just what’s in the model or needing to navigate through complex technical schema. Power BI’s simple point-and-click interface makes it easy to unlock and share insights. Here is a quick introduction video of Power BI working with SAP HANA. The SAP HANA connector brings BI artifacts such as analytic and calculation views to the forefront for users, and makes it to easy discover important content. More advanced users can still connect to the row and column tables by writing direct SQL, but the experience has been simplified without sacrificing capabilities for more advanced use cases. Users can easily pick measures and dimensions with user friendly captions and not just the default technical names in the schema. You can also input the parameters and variables, if required, with look-up values that are automatically retrieved. This tool provides a quick preview of the data upfront for the user so they can decide what information they will need before completing the connection. Power BI Connector for SAP HANA supports both DirectQuery mode and Import mode. visualization, Power BI Desktop queries the underlying data source and fetches the data needed on the fly. So, if you do not want the data to leave your source and be stored externally for any reason (for example security compliance or maintaining a single version of the truth), then DirectQuery is the option to use. Many data modeling and data transformations are available when using DirectQuery, though with some limitations. 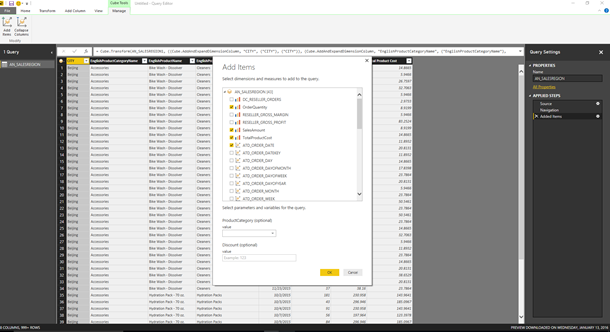 Import – Data for the selected tables and columns are imported into Power BI Desktop along with the metadata. 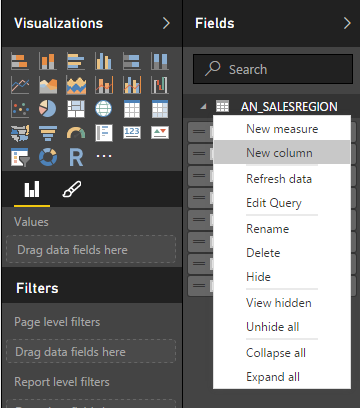 As you create or interact with a visualization, Power BI Desktop uses the imported data. You must refresh the data, importing the full dataset again, to see any changes that occurred to the source. If you are working with small amounts of data, or if you would like to work offline, then Import might be the option to consider. 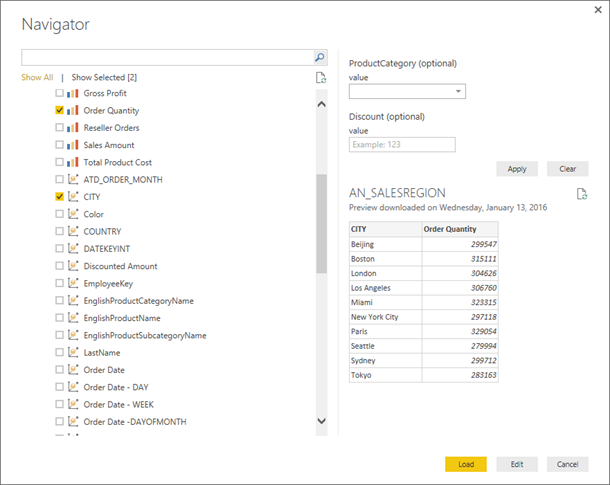 As always, Power BI allows you connect to multiple tables/views, shape and combine them the way you want, and define relationships to discover new insights. It also allows you to create calculated columns and measures at the report level, so even if you don’t have developer or admin rights to SAP HANA, you can self-service your own needs in Power BI without waiting for the IT team’s help to modify the model. You can also return at any time to the Query Editor and use more measures and dimensions from SAP HANA or change the parameter / variable value. 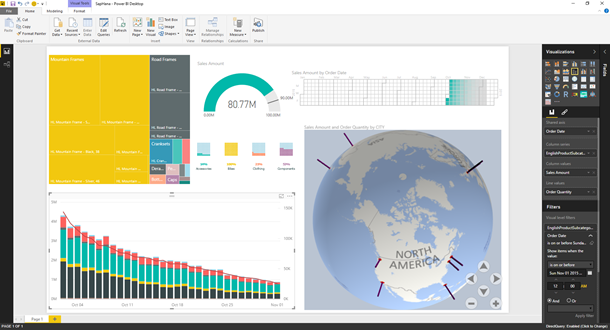 Power BI allows you to explore the data with insightful drag-and-drop visuals that work together on an interactive canvas. The core visuals come with fine-grained formatting capabilities that allow you to tell a data story in your own tone, while the growing list of custom visuals means you can express yourself and your domain in whichever way best suits your data. Once you are ready to share, you can publish your report directly to the Power BI service from within Power BI Desktop. Once published, you can access the report from anywhere, including the web and from most mobile devices with the Power BI Mobile app. Note that the Enterprise gateway must be installed and configured for the Power BI service to connect back to on-premises SAP HANA sources. The initial reaction for this the new SAP HANA connector have been overwhelmingly positive, and we are very excited about the new opportunities this will create for our users.